This is written in terms that apply to a house concert host, but it could be useful for anyone who uses Facebook to promote their events. Many who use Facebook events to promote their shows wind up disappointed with the lack of commitment we get. Sometimes fewer than half of the people who are “going” actually show up. Rather than shaking our heads at people’s level of commitment, we can take the opportunity to step up our own commitment. 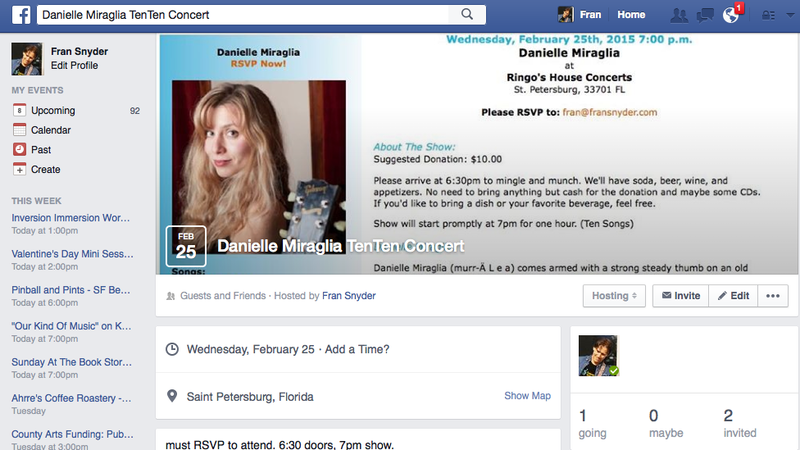 What if you sent a personal message to every person who connects with your Facebook event? How about asking for a commitment? Think of your Facebook event as a starting point. It’s a lead-generator, not an RSVP list. Take the follow up steps to get people to actually commit, and to enable you to check in a few days before the show with a confirmation email. One final point: This is an opportunity to be friendly with your friends. Care about them and they’ll care more about you and your events. PS – This type of effort could also work with Meetup and any social invite platform.